Serrapeptase is an enzyme that naturally eases minor pain and inflammation from overexertion or everyday activities by breaking down extraneous fibrin, mucus and other compounds that congregate when the body's natural repair functions are working. 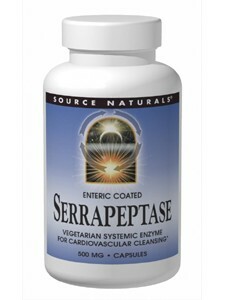 Serrapeptase promotes cardiovascular and arterial health, and it supports the body's natural processes for both drainage and repair. * Suitable for vegetarians. Suggested Use: 1 to 2 capsules twice daily as needed on an empty stomach with at least 8 ounces of water. Other Ingredients: maltodextrin, hypromellose cellulose (capsule), hydroxypropyl methylcellulose phthalate, talc, triacetin, purified water, ethanol, and medium chain triglycerides. Warning: Do not take if you are pregnant, may become pregnant, breastfeeding, or if you suffer from any gastrointestinal disorders such as ulcers. Consult your health care professional before taking this product if you are taking any drug that affects blood coagulation such as prescription vitamin K, heparin, warfarin (coumadin(R)), or aspirin. Discontinue use if nausea, diarrhea, or other intestinal discomfort occurs.